Jan-Eric Litton received his Ph.D. from Karolinska Institutet in 1983. In 2002, he was appointed Professor of Biomedical Computing Technology at Karolinska Institutet. He was one of the driving forces behind the initiative that later evolved into BBMRI-ERIC and was BBMRI-ERIC’s first Director General from January 2014 until July 2017. 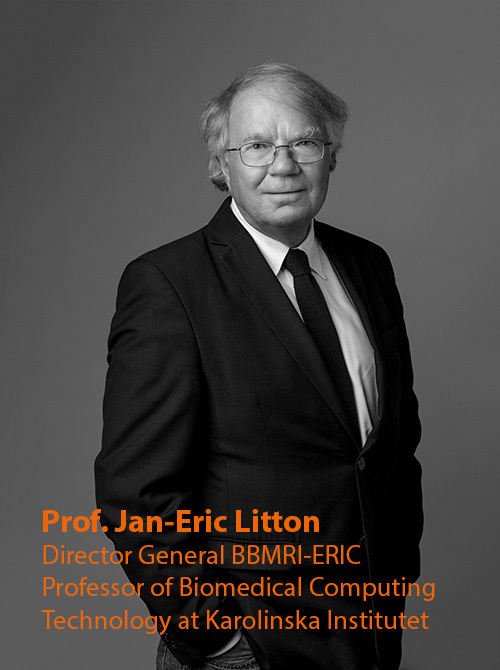 Professor Litton was Executive Director and Head of the largest medical infrastructure in Sweden, BBMRI.se, and was Coordinator of the Nordic BBMRI, a Northern European Research Infrastructure. The first edition of the HandsOn: Biobank congress, the predecessor of the Europe Biobank Week, saw the light in Uppsala in 2012. In 2015, he led the initiative in creating the Global Biobank Week. Professor Litton, as keynote speaker, will open Global Biobank Week 2017. His speech will centre around ensuring the reproducibility and reliability of scientific work as the heart of medical science.